Kris Mason founded the Seattle Children’s Chorus in 1989. Under Kris’ leadership, the organization has grown from one small neighborhood choir to a recognized and respected choral arts program, offering six choral levels to young musicians between the ages of three and eighteen. Along with her work as Artistic Director, Kris conducts Arioso and Intermezzo, the upper- level and intermediate level treble choirs. ARIOSO has been honored to receive three invitations to perform for Northwestern Regional Conferences of the American Choral Directors Association and one invitation to the ACDA National Convention in Los Angeles, 2005. Her choirs have been privileged to travel throughout Great Britain, Scandinavia, Central Europe, Canada and Brazil, sharing the beauty and joy of singing for audiences at festivals, competitions and in some of Europe’s most exquisite cathedrals. Kris has served as a past president for Washington State Choristers Guild and the Repertoire and Standards Chair of Children’s Choirs for Washington State American Choral Directors Association. In 2012, Kris was the recipient of the American Choral Directors Association “Leadership and “Service Award” for the state of Washington. Kris holds a Bachelor of Arts Degree in Music Education from Seattle Pacific University. Jennifer Hanson is director of Brio, the training level of Seattle Children’s Chorus. Jennifer has a degree in Music Education from the University of Indiana. Her 12 year instrumental music teaching experience has included conducting award winning orchestras, wind ensembles and jazz bands. She is actively involved with the music ministry at her church, where she plays piano for services, directs the adult choir, a young teen treble voice choir and a young children’s choir. Gillian Malacari, director of our Shoreline Poco a Poco, has a Bachelor of Music Education with Honors from the University of Western Australia majoring in Primary and Secondary Education and String Pedagogy (violin). Her Honors thesis was on ethnomusicology and she became interested in how different cultures approach music education. Gillian has taught in several international and independent schools in Australia and Asia and is trained in Orff, Dalcroze and Suzuki methods. She is currently an examiner for the International Baccalaureate music performance and paper exams and maintains a small number of students in her private studio. Gillian‘s educational experience is broad and includes the start-up and development of several K-12 Music programs and several string programs. In every program she has developed she has compulsory K-5 choral classes (in addition to class music time). Gillian has a strong belief that voice exploration and movement activities, in early childhood music education are one of the most robust ways to develop well-rounded musicians who feel confident interacting with music for life. Randi Teigland-Hendrix has been accompanist for Seattle Children’s Chorus since 1997. She currently plays for Camerata and Coro Vivo. She is a graduate of Seattle Pacific University, holding a Bachelor of Arts degree in piano performance. Randi has taught at the college level and privately for many years. She is an active accompanist, playing for various conductors and performers in the Pacific Northwest, and also serves as pianist and organist at Grace Lutheran Church in Edmonds, Washington. Debra DeMierojoined our artistic staff in 2006. Performer, teacher, adjudicator, accompanist and singer, Debra has a Master’s in Music with a Piano Performance emphasis from Washington State University, and Bachelor degrees in Piano Performance and Piano Pedagogy from Seattle Pacific University. She has studied with Marcile Mack, Ruby Bailey-Ronald and Bela Nagy. In addition to serving on the music faculty at Edmonds Community College, Debra accompanies the Sno-King Chorale and serves as Music Director at St Thomas More Church. She enjoys teaching in her home piano studio, adjudicating and singing in the Seattle Jazz Singers. Debra and her husband, Vince, live in Brier and have four children and three grandsons. John Hendrix has been the director of Camerata since 1999, when the newly formed group was called the Chamber Singers. He has worked in both public and private music education, as well as church music for over 30 years. Currently, John teaches choral music at Shorewood High School in Shoreline, Washington, and is the choir director at Grace Lutheran Church in Edmonds, Washington. Under his direction, his choirs have received national recognition, having been invited to perform at a variety of concerts, festivals, and competitions, where they have consistently received top ratings. John is also a vocalist and has had the opportunity to sing under many conductors and teachers who have had a profound influence, including Robert Shaw, Eric Ericson, Dale Warland, Paul Salumonivich, and Weston Noble. John has served as Repertoire and Standards Chair for both Community Choirs and Jazz Choirs for the American Choral Directors Association in Washington State. He earned a Bachelor of Arts degree in Music Education from Seattle Pacific University, and a Master’s Degree in Choral Conducting from Western Washington University. Lindsay Hogan directs our Marysville Poco a Poco. She received her bachelor’s degree from Manhattan School of Music where she majored in oboe performance. Lindsay’s education in New York City helped her explore all kinds of music, from bluegrass to samba, increasing her love for music from diverse traditions. She includes music of varied genres in her teaching to spark curiosity in her students. Lindsay maintains a private studio where she teaches piano, voice, oboe, guitar, and mandolin. Laurie McFarland, takes on the lead accompanying position for both Intermezzo and Arioso, after having long been a substitute accompanist for SCC. Laurie graduated from Seattle Pacific University with a Bachelor of Arts in Piano Performance and later studied with Patricia Michaelian and Holly Herrmann. 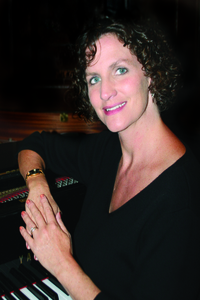 Laurie has had years of experience as an accompanist for soloists, schools and other professional organizations. She currently plays for Bethany Community Church Greenlake, maintains a small piano teaching studio, and homeschools her four boys, all of whom are involved in various levels of SCC.